Contrary to rumors circulating on the Internet today, Joni is not in a coma. Joni is still in the hospital - but she comprehends, she’s alert, and she has her full senses. A full recovery is expected. The document obtained by a certain media outlet simply gives her longtime friend Leslie Morris the authority - in the absence of 24-hour doctor care - to make care decisions for Joni once she leaves the hospital. As we all know, Joni is a strong-willed woman and is nowhere near giving up the fight. 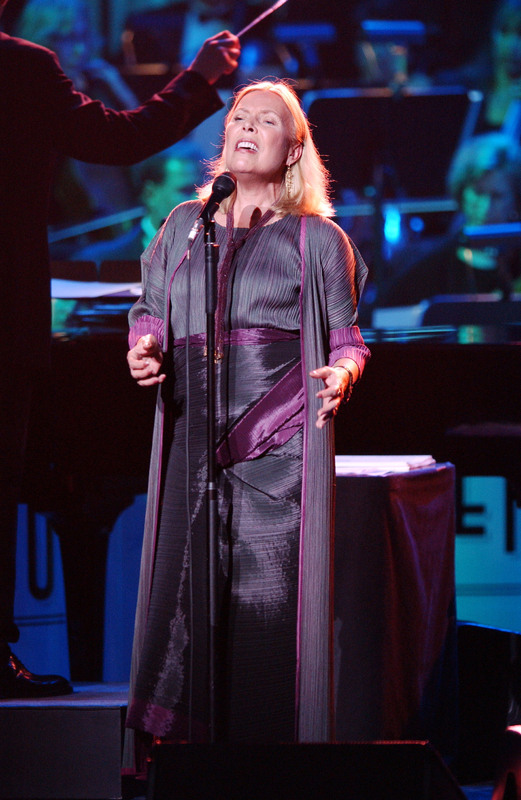 Please continue to keep Joni in your thoughts. You may add your well wishes for her at the website WeLoveYouJoni.com. This is, of course, amazing news for family, friends, and fans of the legendary singer. Mitchell's music has given the world so much that to hear she could be in such a dire situation was truly heartbreaking. Mitchell first rose to fame in the late '60s as a folk artist and a singer-songwriter who solidified her place amongst the other musicians of the Woodstock generation. Her music spoke for itself with haunting lyrics, which were often hopeful, tragic, and deeply introspective all at the same time. But while Mitchell wasn't always an optimist on love, her music did feature some important words of wisdom. There's a reason why putting on a Mitchell album makes you feel a bevy of emotions — there's meaning behind those words. Here are some of Mitchell's most important lyrics on life and love that illustrate just what an iconic artist she is — think of it as a celebration of this amazing news. "And you love your lovin'/But not like you love your freedom" — "Help Me"
Describes: When you are on the verge of falling in love with the person who refuses to be tied down to anything or anyone. "I've looked at love from both sides now/From give and take and still somehow/It's love's illusion I recall/I really don't know love at all" — "Both Sides, Now"
Describes: When you spend hours analyzing your last relationship post-breakup. Some things are meant to be accepted, not understood. "I got a bird that whistles/I got a bird that's singin'/If I don't have you darlin'/Birds don't mean nothin'" — "A Bird That Whistles (Corrina, Corrina)"
Describes: When you're head-over-heels in love. "When love makes a fool of me/After the rush when you come back down/You're always disappointed/Nothing seems to keep you high" — "Woman Of Heart And Mind"
Describes: When you simply can't take another day in a one-sided relationship. "We don't need no piece of paper from the city hall/Keeping us tied and true" — "My Old Man"
Describes: Someone who doesn't need to get married to be in love, thank you very much. "I could drink a case of you/And still be on my feet." — "A Case Of You"
Describes: When the person you love (or loved) now feels like a part of your soul, for better or for worse. "If your head says forget it/But your heart is still smokin'/Call me at the station/The lines are open" — "You Turn Me On I'm A Radio"
Describes: When you want to give the person just one more chance to get what they want.